Vintage Spartus Solid State Alarm Clock Model 21-3004-500 - Tested Working. Condition is Used. Shipped with USPS Priority Mail. The tail is missing and the eyes are pushed in so they don’t work. This is for repair or parts. I try to take several good photos to show the condition and ask that you look at them carefully. I cannot describe every little thing. Snooze Works Tested. If you find a number of things you are interested in. SPARTUS Solid State Vintage Alarm Clock - Mo. 1029 - TESTED . Condition is Used. Shipped with USPS First Class Package (2 to 3 business days). In good condition. Back needs a little cleaning and front had some very minor nicks. Not certain but think it's from the 1960s. It is 10" tall x 5" wide x 2 3/4" deep. I believe the plastic is a hard plastic but it is swirled to look like bakalite. It is a model 730 and has a date code of 1961 on it. The plastic screen is curved but this would be a good parts clock or replace the plastic screen possibly with a flat Plexiglas one. Good pre-owned condition with minimal minor surface scuffs/scratches. Condition is Used. PM indicator light. The Clock Is In The Style Of A Regulator Clock. Missing its battery flap, but otherwise in good overall condition. Fully tested and working. If you find a number of things you are interested in. Used item. Very small scuffs. Actual item you are buying. Spartus Solid State Alarm Clock Model 21-3004-500 Vintage Faux Wood - Tested. Condition is Used but in great condition. 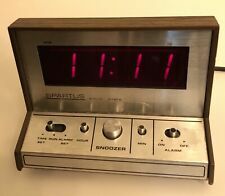 Vintage spartus alarm clock. Condition is Used. Shipped with USPS Priority Mail. Vintage 1960/70's Spartus electric plastic wall clock. In very good condition. No cracks or breaks. Clock runs well. Measures 12" tall and 7-1/2" wide. Will package carefully. PayPal preferred. Vintage Spartus Alarm Clock amazing condition TESTED and WORKS. Condition is Used. Shipped with USPS Priority Mail. Made by Spartus, the clock is black and in the shape of a frying pan. Made of plastic, the clock is electric and has an off-white colored cord. I've tested the clock and it seems to work fine. There are no breaks or cracks to the clock body. VINTAGE SPARTUS 1108 ALARM CLOCK: Red LED display, 1980's, Battery Backup TESTED. Condition is Used. Shipped with USPS Parcel Select Ground. Growls if not level. There are plenty of scratches on the front cover but not enough to hinder viewing. There are superficial cracks in the plastic on the back side. These clocks used to hang in bars. Vintage SPARTUS Wall Clock Yellow Quartz Rounded Square Design Raised Numbers - 7.5" x 7.5" - USES ONE "C" BATTERY TESTED - WORKS PERFECTLY, KEEPS PERFECT TIME, UNIQUE YELLOW SPARTUS CLOCK THANK YOU FOR LOOKING, HAVE A GREAT DAY! Vtg Spartus Bar Clock Sign Have Another Backwards Running Made in U.S.A. Chicago. Condition is Used. Shipped with USPS Priority Mail. You are buying a fantastic Mid Century Modern Spartus black & gold plastic electric wall clock. 1950's original all original parts. Good working condition. No problems to report. Audio great. Has external antenna, and battery backup. Good high quality clock radio. Vintage SPARTUS 1140 Alarm Clock RED led display 1970's/1980’s TESTED! Beautiful and in great condition! The screen has some stains but nothing that affects the look or functionality (please see photos for reference). This item is sold as is, thanks for taking a look. Vintage SPARTUS 1140 Alarm Clock RED led display 1970's/1980’s TESTED!. Condition is Used. It was designed for the modern kitchen of the early 1960s when the race into outer space was at its height. It would look good in any room of the house,(or office). Fire Sale! Fence sitters, this is your chance! 1960'S SPARTUS DACHSHUND RED FIRE HYDRANT WALL CLOCK W/ WAGGING TAIL - WORKS!!! In excellent working condition, the dogs tail wags up and down with every second! A happy (and about to be relieved!). doggy indeed! Marked "MADE IN USA" on the front. Has a sticker on the back that says "166-XMMCNN SPARTUS CORPORATION LOUISVILLE, MISS. 39339 U.S.A. MODEL NO. Spartus Corporation. The sign has a new battery operated clock. There is a knob on the bottom to turn on the light in the "Bar Is Open" portion. Model 6070. Mid-Century Patriotic Clock Spartus Presidents White House Vintage Working. Mid-Century Patriotic Clock Spartus, has 35 presidents on the front. Can hang it on the wall or it will sit on a flat surface. Bthrm. The clock is in very good to excellent condition. The clock works great. The clock is made of plastic. Sorry about the reflection from the light. Retro Working Spartus Orange Tea Kettle Pot Mid-Century Clock Retro Vintage USA. Condition is Used. The clock does show where from the years simply see photos for best description of condition in for what you will receive. Thank you Shipped with USPS Priority Mail. Spartus Wall clock with light up lamp. On the back of the lamp there is one tiny screw missing in the right bottom corner. Easily replaced, and it does not effect the lamp even if you don't replace it. Vintage Spartus Electric Wall Hanging Clock-Roman Numerals-Brown/Black-Works! Great country or retro decor! Top part doesn't turn & is for style. 5.75" width. For sale is an authentic mid century wall clock. This clock is plastic and white tone with golden accents on the leaves and face. The pieces that surround the clock face slide off and on and clip to each other near the top. Spartus Electronic Digital Alarm Clock Hi Tech Model 1150 VINTAGE tested works!